sesphene (5 weeks ago) Inappropriate? Thank you very much! Great character!!! Sidhe Rose (10 months ago) Inappropriate? Thank you! He looks great! Thank you for been so generous. This is great. Gilraen (3 years ago) Inappropriate? Hi. Whatever became of the posing pouch? Did you release it and perhaps I haven't seen it, as I was looking here for word of it? Thanks so much for the Vincent character! Love him! KnochenKater (3 years ago) Inappropriate? Wow!! Amazing! Thank you so much for share! WillShetterly (4 years ago) Inappropriate? "It is marked as "non-commercial" only, and the readme mention this too, but I did not explained myself right. I meant non-commercial for works including the image of Vincent or any other copyrighted character. Just the same as you would behave with any other product sold at Daz3d.com or elsewhere. "But otherwise, of course you can use this on commercial works as well! Feel totally free to do so!!" 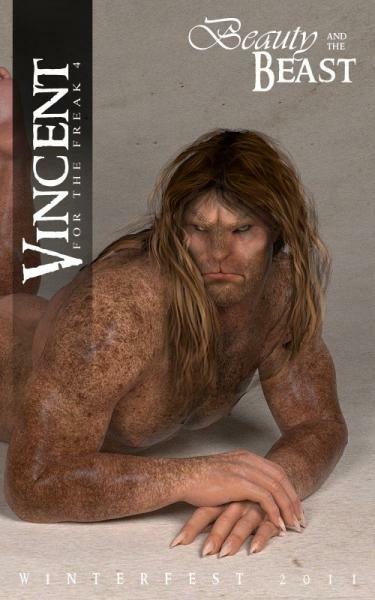 Obviously, given that Vincent, as a character, is a copyrighted character, renders of him can't be used commercially, How about just the HAIR on other characters? That hair style is not unique to Vincent. vycanthus (5 years ago) Inappropriate? What clothing is everyone using? I'm having problems finding high enough quality clothing to do Vincent justice! What a testament to talent, patience and dedication...thank you so much Hellboy! righthell75 (5 years ago) Inappropriate? Thank you Hellboy Look so great! Gisela (6 years ago) Inappropriate? japintx (6 years ago) Inappropriate? I downloaded a while back, and still to date it is by far my all time favorite. This is a must download. For those of you unsure, you will not regret. Thanks! Thanks for the kind words everyone! So many people has asked for the posing pouch so much I will definitelly make it available, hopefully during the next weeks. That was its purpose since the beggining, but I was very inexperienced when I did it. I modeled it against the Freak 4 shape, making it unusable on other characters. I will reshape it to Michael 4 and add the required morphs instead. That more …Thanks for the kind words everyone! So many people has asked for the posing pouch so much I will definitelly make it available, hopefully during the next weeks. That was its purpose since the beggining, but I was very inexperienced when I did it. I modeled it against the Freak 4 shape, making it unusable on other characters. I will reshape it to Michael 4 and add the required morphs instead. That would make it more useful for you since you're not limited to Freak 4 alone. Jaike (6 years ago) Inappropriate? This is by far one of my favorite characters to use. Thank you so much for providing a complete package. I only have one request. I agree with Wertu, I too would like to have the 'posing pouch' to use with Vincent. TheOwl68 (6 years ago) Inappropriate? Thank you so much for sharing this amazing character package, very generous of you =) your work is outstanding! orachel (7 years ago) Inappropriate? Thanks so much! My friend Marie and I are both huge fans of the character, and she found this morph and just had to tell me about it... really fabulous. And somehow you've managed to do the perfect stringy wavy hair without the 1993 crazy crimping iron effect that most 3d wavy hair has... Kudos, and thanks SO much for the hair fits! Will definitely come in handy! Thanks!!! Hellboy (7 years ago) Inappropriate? I want to make it available, but as it was for personal use, it has some issues that should be fixed before that. wertu (7 years ago) Inappropriate? Thank you so much! Also, I would be deeply appreciative if you share "posing pouch" he is wearing. Is such a thing available anywhere? FireFoxx (7 years ago) Inappropriate? Your generosity is commendable. Thank you, your excellent work is very appreciated. Thank you so much! I didn't realize he was free!! Of course I saw his picture already long before now. I was a big fan of the series back then. Just now I read on the DAZforum about him being free.So I rushed over here to get him. Thank you again! Thank you for te nice words! It makes me really happy! Hope you have fun playing with him! NV Oracle (7 years ago) Inappropriate? Not that's he's wearing that much. LOL! davidmaxx (7 years ago) Inappropriate? thnx a bunch wondering if ya gots any of the clothing shown on your promo pic of vincent? Thank you very much for this stunning work of art. spm91g (7 years ago) Inappropriate? Elgyfu (7 years ago) Inappropriate? A huge thankyou, he is wonderful! He looks absolutely amazing, Hellboy. Thank you so much for sharing him. AUMaize Designs (formerly LA3D) (7 years ago) Inappropriate? We've never worked with Freak or Freak 4, but this may be the first time we do. Excellent work on him. Looks just like him. thepig91 (7 years ago) Inappropriate? thank you very much! It's a BIG work!! Mig (7 years ago) Inappropriate? Very generous of you to share this wonderful creation. Thank you. networthy (8 years ago) Inappropriate? Absolutely spectacular - thank you for your generosity! Hellboy (8 years ago) Inappropriate? Thank you all for the nice comments! Please, have fun with the character! alexlloyd54 (8 years ago) Inappropriate? azrielarn (8 years ago) Inappropriate? This is one hell of package. I'm using a modified version of the texture in my current project and I love IT! ThanX Hellboy for creating and sharing Morph pac! Kimberly Stevens (8 years ago) Inappropriate? Wow he is spectacular! Thanks! HeatherT (8 years ago) Inappropriate? This is a truly wonderful character and given so generously. Thank you sooo much! Kaytee (8 years ago) Inappropriate? One of my favourite characters. Wonderful work. williamrippey (8 years ago) Inappropriate? next to the horde, this is the greatest. pefectly done, i think this beats the horde. thank you for being so generous. Tugpsx (8 years ago) Inappropriate? dotdotdash2 (8 years ago) Inappropriate? dreamdesigner (8 years ago) Inappropriate? I knew I would see something like this from you one day!!! WalkerofShadows (8 years ago) Inappropriate? Beautiful work, thank you for sharing :) I look forward to seeing what else you come out with! retrodevil (8 years ago) Inappropriate? eclecticitys (8 years ago) Inappropriate? Auset (8 years ago) Inappropriate? Thanks for such an awesome gift! dbeez13 (8 years ago) Inappropriate? this is soooo awesome thank you so much!!! Wow! It looks JUST like him! I was a fan back in the day & I love Ron P. This is awesome! Thank you for sharing this! Rendersapien (8 years ago) Inappropriate? Thank you so much for sharing this incredible model! You are so generous to give this model (which obviously took a tremendous amount of work) away for free. nonotoy (8 years ago) Inappropriate? He certainly is a beauty. Thanks for your generosity! The shader settings would be the ones showing in these promo renders. Or maybe just slightly different. Dont remember. But they are the ones I'm using right now. Hope they are more …Thanks a bunch ppl! Seerose (8 years ago) Inappropriate? Misty (8 years ago) Inappropriate? Elfmaid (8 years ago) Inappropriate? OH my goodness he is GORGEOUS! THANK YOU!!!! Awesome, brillant work! Truly amazing likeness of the character and so complete. Thank you for your generosity. What's more amazing than your character is all the work you put into it and then give it away. What an amazing, complete, and who can believe it FREE character. I am also a fan of the series. I can't wait to get this into a reality render. Absolutely incredible that this is for free!!! i have seen th9is on renderosity!! Amazing, very amazing! DarkeWolf (8 years ago) Inappropriate? Absolutely incredible. Downloading right now, he looks amazing. Thanks so very much for sharing him with the community! Thank you so much, funny was just talking about watching this series the other day..this is so cool!! 12rounds (8 years ago) Inappropriate? ladyelf (8 years ago) Inappropriate? Remember he works on M4 too. The only use for F4 in this product is the body shape, but you can use your own morphs on M4. Head morph does NOT require F4. boso123 (8 years ago) Inappropriate? Porthos (8 years ago) Inappropriate? Irishmiss (8 years ago) Inappropriate? Thank you ever so much, SOTO for giving us such a unique character. I can't wait to check it out. Such great talent here -- keep up the good work. Mirabilis (8 years ago) Inappropriate? MtnMist (8 years ago) Inappropriate? Thank you so much for sharing your talent and creation. sidneypoitier (8 years ago) Inappropriate? Superb! Thank you so much and congrats for the dedication! Thank you all! I'm glad you are liking him! TinyAngel (8 years ago) Inappropriate? Amazing work, really! Thank you so much for sharing your talent! RainbowGypsy (8 years ago) Inappropriate? Wow, he is absolutely amazing! You just made my day. I can't wait to try and create images with him. Thank you so much!! This is the most amazing package you could ever get for free!!! Thanks so much for making this. My childhood is back! for free ?? WOW Thank you very much !!! Maddjeeper (8 years ago) Inappropriate? Great Job, love the character. romulus71 (8 years ago) Inappropriate? Hey Paul, someone already used him on a female character. Its a really cool image. Beautifully done! I'm especially pleased with the multiple hair fits. Paul Telesco (8 years ago) Inappropriate? legolie (8 years ago) Inappropriate? Exceptional ! Amazing character and hair ! Thanks a lot ! Amaranth (8 years ago) Inappropriate? Thank you very much, can't wait to render ! missblue63 (8 years ago) Inappropriate? julesart (8 years ago) Inappropriate? Exceptional creation! Indeed this is magnificent! I am in awe! Thank you for sharing this creation! KristinF (8 years ago) Inappropriate? Astonishing creation and sooo generous. HB you are a sweetheart! helslice (8 years ago) Inappropriate? Thank you very much for your kindness. This is a great looking character. Hope to see more of your work and by the looks of Vincent, we will be in for a treat!!!! Tomokatu, thanks a lot for leting me know! I just signed yesterday! Terrific work. I loved that show and am thrilled that I can now have my very own Vincent. Thank you so much. hal001 (8 years ago) Inappropriate? thank you very much for this caracter. It gonna be very usefull for my next render. wOw! What a STUNNING creation! Such detailed skin and even a hairprop! *deep bow* for this fantatic product!! Your Vincent character has made a great hit at www.faeriewylde.com. Several renders and portraits have already been made and publshed. You'll need to register to login and view them but you'll be very welcome! ToniDunlap (8 years ago) Inappropriate? What a generous person you are to share your fabulous work. It is a masterpiece if there EVER was one. Thank you most kindly!!!! timberoo (8 years ago) Inappropriate? mstene (8 years ago) Inappropriate? wooooow! Beautifully done & unbelievably generous of you. MKeyes (8 years ago) Inappropriate? Free? That's what blows me away, free! Wow, I think you could have really made some money from this guy, but I must admit, I'm happy to get him for free! Incredible work of art and beauty! TheKatster (8 years ago) Inappropriate? I is so generous of you to share this amazing character with us for free no less. I can't wait to install him and use him. this nis most excellent i saw him yesterday first time and now i had to get him.thanks for the generosity huge pack it is. tsuki (8 years ago) Inappropriate? Romancefantasy (8 years ago) Inappropriate? Wow, thank you so much. He is beautiful. You did a GREAT job on this! Thank you! What can I say that hasn't already been said? This is really, really wonderful!! Thank you so much. Thank you so much this is absolutely amazing !! UUUH~! There are not enough stars for this one.. He is fabulous, gorgeous, fantastic!!!! THAnkyou!!! thanks so much for this ! !...downloaded it today..everything works perfectly. this is also perfect timing as it will be just perfect for one of my next projects...will post back with the results..thanks again ! Omg, he looks absolutely gorgeous! Thank you for making him available. Flamewing (8 years ago) Inappropriate? Absolutely gorgeous. Thank you for such a fantastic character. 1gecko (8 years ago) Inappropriate? charly (8 years ago) Inappropriate? Fantastic work. Thankyou so much for sharing. Thank you very much for the nice comments ppl! Im so happy you are liking him, and so exited to see your creations with him already!! silverdolphin (8 years ago) Inappropriate? Danka,Muchas Gracias,Domo Arigato,Thank you Very Much! Andy (8 years ago) Inappropriate? This guy will be FUN!!!!! DAGrant (8 years ago) Inappropriate? Simply astounding! He is beautiful, thank you, thank you for such a well made character. kolfur (8 years ago) Inappropriate? sissy (8 years ago) Inappropriate? Great professional work. Thank you. OMG, my mom was in love with this guy.LOL. She thought Ron Pearlman as the beast was so handsome. I wish she were still alive. I would make a fine render with your Vincent, for her to have. Thanks for this awesome freebie. I hope you do more. Badkitty (8 years ago) Inappropriate? El Lee (8 years ago) Inappropriate? I usually don't bother with characters, but he looks amazing and i was so in love with this show when it was one. Thank you very much! aztecmarco (8 years ago) Inappropriate? Incredible. Just incredible. Thank you! TheFatGuy (8 years ago) Inappropriate? Cool, a brilliant gift, thank you so much! Ronwald (8 years ago) Inappropriate? This is fantastic! Incredible work. And it renders like a dream. Thank you so much for this character package. anitalee (8 years ago) Inappropriate? wow, he looks awesome, thank you! paperbag (8 years ago) Inappropriate? OMG he's amazing. Thank you! Vivianne (8 years ago) Inappropriate? LadyRaine (8 years ago) Inappropriate? What can i say what haven't said before? WOW WOW and WOW again, he is stunning. He renders like a dream, this character is the best one can get. Couldn't resist to render at once after downloading. KrazyHorse (8 years ago) Inappropriate? WOW! Amazing work. Thank you. CurtieBear (8 years ago) Inappropriate? An amazing work of art. Thank you. Wow! Stellar work on this character. I remember the series and Perlman was the reason I watched it! Thank you so much. Your excellence is only surpassed by your generosity! The only things I can think to say are 'Wow!' and "Thanks!" because this looks amazing!! Am kind of blown away. You are going to make me dust off Freak! Avari (8 years ago) Inappropriate? This looks amazing! Thank you very much! Absolutely amazing. He is incredible, and I can't believe this is free. Thank you! FANTASTIC!!!! YOU SHOULD BE SELLING THIS! TI 'S THAT GOOD!!!!! inquire02 (8 years ago) Inappropriate? I haven't tried this yet; just downloaded it. But, it looks fantastic. It's almost unbelievable that this could be for free. Thank you so much for all your efforts and your great generosity. You've made my day! I need try in Carraa!!!! LadyOfTheCrossroads (8 years ago) Inappropriate? Amazing, now, a Linda Hamilton morph and we are away to the races. salem005 (8 years ago) Inappropriate? This is amazing!!!!!!!! !Can't wait to give him a try! Thank you for your incredible generous gift!!! heavenlee (8 years ago) Inappropriate? Ariah81 (8 years ago) Inappropriate? It's wonderful, such a great tribute to one of the best TV series ever! I can't wait to render him! Thorneldrich (8 years ago) Inappropriate? Absolutely gorgeous! such quality! Thank you so much for this wonderful addition! The best for many years. Incredibly real texture. 5 star already for the renderings. Threshie (8 years ago) Inappropriate? EugyptuS, you're the first one mentioning rendering with him already. I'm very exited about that! What a stunning product. Thank you so much for sharing. sickenlysweete (8 years ago) Inappropriate? Celebi (8 years ago) Inappropriate? this is truely awesome. thank you. Absolutely Awesome! Thank you so much for your time and generosity!!! Joe-B-Wan (8 years ago) Inappropriate? WOW! With all the effort and talent you've put into this, it's a shame that you couldn't sell it. Good on you though, and I hope you're encouraged to continue and maybe create some stuff you can make a profit from too. Fantastic! Alphalioness (8 years ago) Inappropriate? Thank you soooo much. I have always loved this show and this is an awesome set you've made!